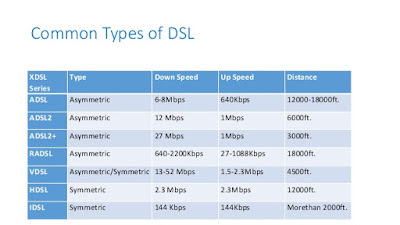 There are many types of DSL (Digital Subscriber Line) broadband Internet connection. Digital Subscriber Line is a technology that brings high bandwidth Internet connection to homes and businesses over ordinary copper telephone lines. Digital Subscriber Line technology allows data transmission at speeds much faster than the best available analog and digital modems. We'll explain a few of the variety of Digital Subscriber Line connections below. Asymmetric types of Digital Subscriber Line connections provide more network bandwidth for downloading from the internet service provider to the subscriber's computer than for uploading in the other direction. By reducing the amount of bandwidth available upstream, service providers are able to offer relatively more bandwidth downstream, which reflects the typical subscriber's needs. Asymmetric Digital Subscriber Line technology is popular residential Digital Subscriber Line service where home internet users predominately use downstream bandwidth. Asymmetrical Digital Subscriber Line: ADSL has a downstream rate of up to 8 Mbps and an upstream rate of 384 Kbps. It supports telephone service and data transmission at the same time. Asymmetrical Digital Subscriber Line 2+: ADSL 2+ is a newer version of ADSL that delivers download speeds of up to 20 Mbps and upload speeds of up to 850 Kbps. G.Lite: G.Lite or ADSL Lite is a version of ADSL that offers slower speeds of up to 1 Mbps downstream speed and 512 Kbps upload speed. Rate-Adaptive Digital Subscriber Line (R-ADSL): R-ADSL delivers the same transmission rates as ADSL, but the transmission speed can be adjusted by the modem. Very High Bit-Rate Digital Subscriber Line (VDSL): VDSL is the fastest DSL service. It offers downstream rates of up to 52 Mbps (Megabits Per Second) and upstream rates of up to 2.3 Mbps (Megabits Per Second ) over a single copper wire. Symmetric types of Digital Subscriber Line connections provide equal bandwidth for both uploads and downloads. Symmetric Digital Subscriber Line technology is popular for business-class DSLDigital Subscriber Line services as companies often have greater needs for transferring data. It is also the technology of choice for simultaneous videos and voice communications, which require high speed in both directions for best communications. Symmetric Digital Subscriber Line (SDSL): SDSL offers equal upstream and downstream transmission speeds of up to 1.54 Mbps. Symmetrical High-Speed Digital Subscriber Line (SHDSL): SHDSL is the same technology as SDSL, but the two standards were approved separately. SHDSL was approved by the International Telecommunications Union, and SDSL was approved by the European Telecommunications Standards Institute. High Bit-Rate Digital Subscriber Line (HDSL): HDSL was developed in the early 1990s, making it one of the oldest forms of symmetric DSL. HDSL offered data rates up to 2.048 Mbps but required multiple phone lines, which eventually made it obsolete. IDSL (ISDN Digital Subscriber Line) is hybrid DSL/ISDN (Integrated Services Digital Network) technology. It was developed along with other types of DSL (Digital Subscriber Line) but is rarely used nowadays due to the relatively low speeds (144 Kbps maximum data rate) it supports. 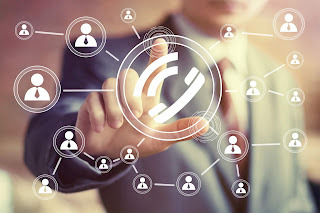 IDSL offers an always-on connection, unlike ISDN.